Business cards on 24 point chipboard with a blind hit and a hit in black for contact info. Here at Rex Mills Printing, we are on top of all the latest and greatest trends--due to all of the great graphic designers we work with. One group we work with nationwide is Ocupop. These business cards are hot off the Kluge automatic press. I love how the natural light from the shop windows makes the blind hit pop out on the card. Chipboard is a very earth-friendly choice--typically it's recycled paper. We just had our first request for letterpress chipboard wedding invitations--it's all the rage right now! 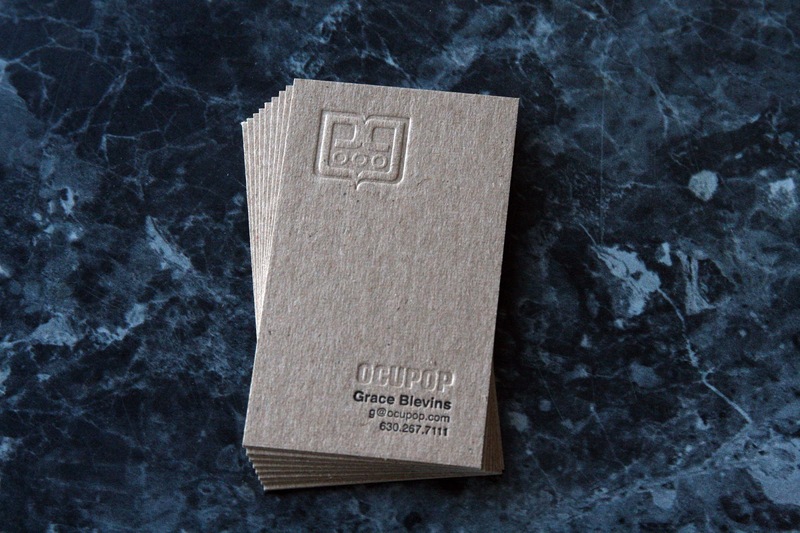 Order your chipboard letterpress business cards today--we can ship them nationwide! Just call (612) 333-8000!